﻿Today I have a fun, bright and bold Easter card, with this weeks sketch. 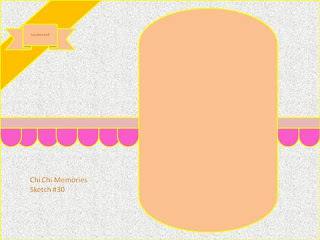 I have used the Easter egg from Chi Chi Memories Happy Easter Digi Set, which is actually on sale. I used the Cosmo Cricket DeLovely paper, to bring this card together, with bright pink satin ribbon. In the corner, I placed a flower with a charm that reads "made with love". I really enjoyed working with this sketch...and I hope that you will join us. Remember, the sketch challenge is open for 2 weeks and everyone is welcome to play this sketch and share their projects here. However, only projects made with CCM stamps are eligible to enter the draw. Thanks for entering this design at CRAFT. So cute! Love your colors and coloring, Calypso. Thanks for joining us for the Easter challenge at Delightful Challenges. This is awesome Calypso, great take on the sketch!!! Happy Easter to you! Hugs! Great card thanks for joining us at Incy Wincy.